This post was originally published May 27, 2014. 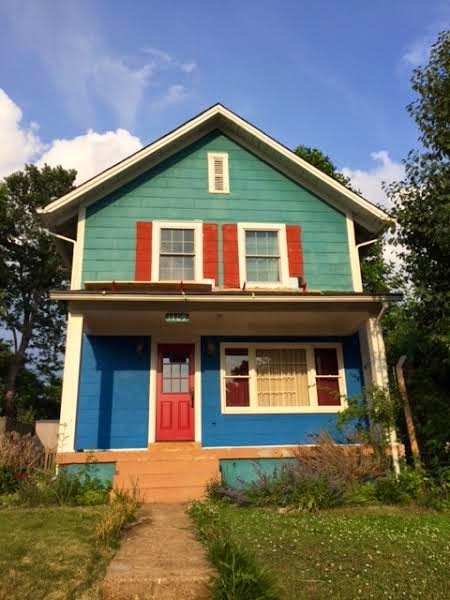 As I mentioned in my very first post, we need to paint our house. Once upon a time, it was a lovely dark teal blue. It has since faded to a sort of teal-ish pea green color. Additionally, at some time in the past, before we owned the house, it was barn red. 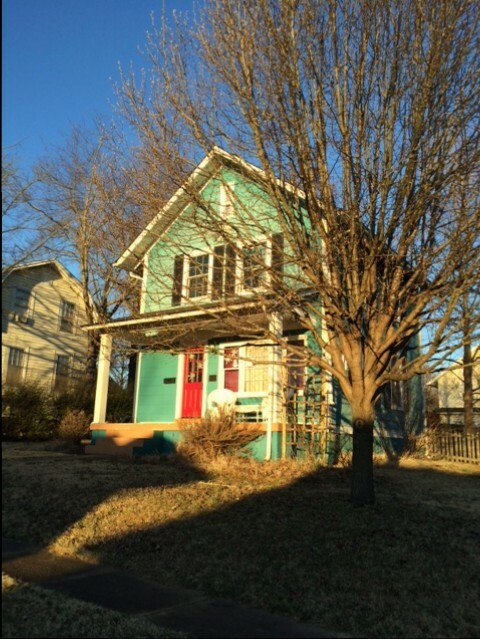 When it was painted teal (a couple of years before we bought it), the painters did not remove shutters. Therefore, the house is still red under the shutters! We had a storm this winter that knocked some slats out the shutters, and there was the red, shining happily through. 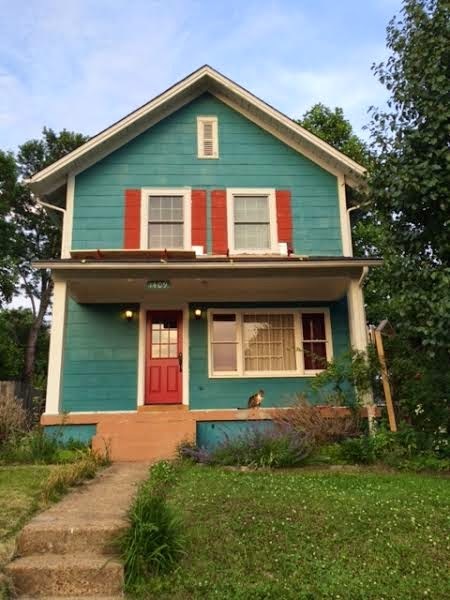 We decided that Memorial Day weekend, I would take an extra day off work and we would paint the front of the house. The plan was to do one side every two or three weeks and be done by the end of the summer. Then, we would come back next year and do all the trim. Some of the trim is damaged and needs to be replaced, and the parts that are not damaged are going to require some serious scraping and sanding. Like all the plans that I make regarding the house, this one was WILDLY optimistic. 1. Wash the house with “house wash” to create a clean painting surface. 2. Caulk any cracked shingles, gaps around windows, etc. (our house is made of either asbestos cement shingles or Hardie shingles, depending on who you ask). 5. High five one another and relax with a beer. So Saturday morning, Day 1, we hit Home Depot to pick up 2 gallons of Behr Premium Plus Exterior Flat paint in Glacier Lake, paint brushes, drop cloths, house wash, and scrub brushes. To clean the house, we had originally selected the Simple Green siding wash, but then of course couldn’t find it anywhere. So we went with Jomax, which did a good job, but the smell was migraine-inducing. Really. I got a migraine. The house was really dirty so we wanted to actually scrub it, not just spray something on and then rinse it off. The first floor went great. Then we got to the second floor. Because we have a porch across the entire front of the house, it was necessary to get on the roof of the porch to reach the second story. It quickly became apparent that the pitch of the roof was too much to just set up a ladder and scrub, which was pretty much my plan for that step. Furthermore, the very nice Little Giant ladder that we own was much too heavy and unwieldy for dealing with on a roof. We scratched our head for a while and decided to just scrub the parts that we could reach and mull over the remainder. And the evening and the morning were the first day. Day 2 arrived. How to reach the top of the second story siding really had us stumped. 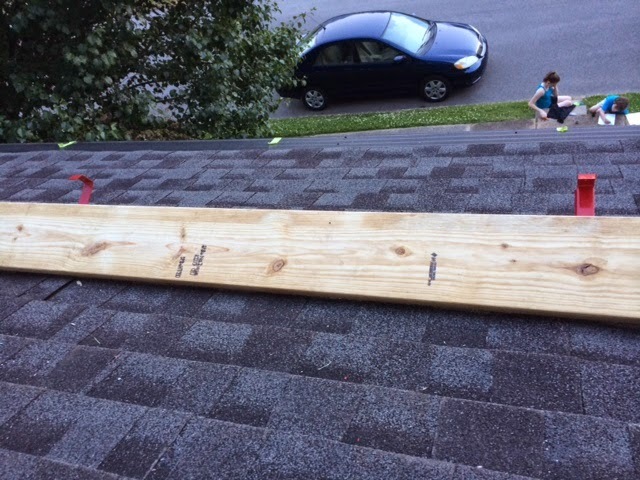 There was discussion of extensions for cleaning and painting, but standing on the roof, we were still a good 10-12 feet from the the top of the siding. Working at that distance with extensions would be extremely difficult. Plus dealing with the ladder was seriously exhausting for my husband. So at that point, we chose instead to engage in an extensive argument which pretty much killed the rest of the day. We did get around to caulking the first floor at least. Luckily, it was four-day weekend, and we had two days left. And the evening and the morning were the second day. Day 3. The internet is our friend! We trotted back to Home Depot for some roof brackets, roofing nails, and a couple of 2 x 10s. Then across the street to Lowe’s for a Werner Upgear Roofing Safety System. This thing is AWESOME! (I was unable to find it Amazon to link to it, but it is TOTALLY on my list of wonderful stuff!) The kit includes a safety harness, a rope lifeline, a safety tether, a roof anchor, and the screws to attach the roof anchor. Then off to Sherwin-Williams for the coolest Xtend & Climb telescoping ladder ever by Xtend & Climb! It extends to 20 ft, but collapses to about 30 inches, and is light enough that even I can lift it. My husband attached the roof anchor to a rafter in the attic and we ran the lifeline through the attic vent down the front of the house. We installed the roof brackets and laid a 2 X 10 across it. The board was slightly tilted towards the house, so it would push on the legs of the ladder, directing it towards the house, substantially reducing the chance of slippage. You can get an idea of the height from this picture, and it was taken from the window. The board in the picture is an 2 X 8 – we actually used a 2 X 10 as it fit better in the brackets. With everything in place, we were ready to get on the ladder and clean. I suited up in the safety harness and adjusted all the straps. We climbed out on the roof, I clipped on the safety tether, my husband held the ladder, and up I went. The trick is to not look down. We rigged up a rope to use as a pulley, so I could pull up the hose for rinsing, as well as change out scrub brushes. Two hours later, the house was all clean. Isabella, sitting on the front porch, approves. I told you the house was red under the shutters. Hey, at least it kind of matches the door! 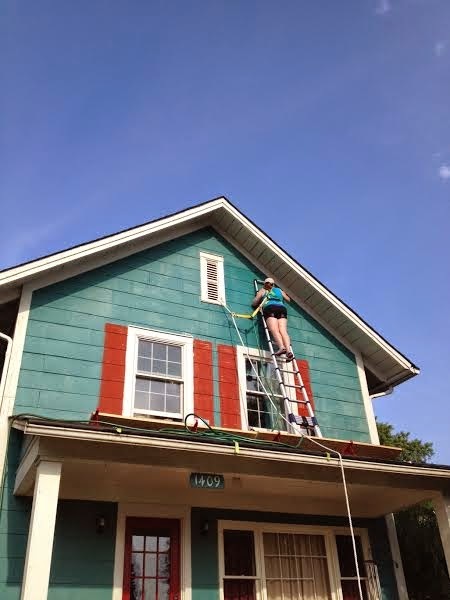 After scrubbing the house 30 ft up, my legs were pretty Jell-o-y, so we called it a day. And the evening and the morning were the third day. Day 4. I went to bed with a migraine which didn’t go away until about 3 a.m. Completely exhausted, I slept until 11 o’clock. My husband let me sleep, because, as he said, I looked like I was in pain and I needed it. After a late breakfast, we headed out to the front porch, and were able to get the first coat of paint on before picking up our daughter at school. Hurray! It looks even better in real life. We hope to get the rest done next weekend. It’s going to be stunning when the whole house is done.